Unlike the past where we stood in front of our stoves for hours to cook, today, we have gadgets like the instant pot which eases cooking while limiting the time you spend in the kitchen. It’s utterly versatile being a multicooker. From pressure cooking your food to steaming among other functions, this tool is a must-have. No one wants to spend hours cooking on the stove top when they can do the same with a press of a button. The article will compare the two kitchen options then let you decide which one works best for you. An instant pot is a programmed multicooker that is designed to consolidate the cooking and preparation process in one gadget. Depending on your model, the programmed functions may vary. Below are the functions you expect any basic instant pot. What better would you want than a tool that limits the need to buy extra equipment? For the skeptics, this might be too good to be true. But it works. In fact, some instant pots have other functions like egg maker and cake maker. An instant pot is an easy to use tool for even non-chefs. In fact, it feels as though you only need to throw ingredients in and turn then cover and press a button. This is a Canadian design that was made with the safety feature in mind. Who wouldn’t call it a ‘smart cooker’? I can imagine all the people experiencing the economic strain. When you use this appliance, you are sure to cut on your utility bills. It speeds up your cooking to about 2-6 times faster saving about 70% of the energy you would have used. The food produced here is also rich in nutrients while being consistent and convenient. It further has the 7-in-1 functions that were earlier discussed and it helps you to save the space because it’s not as large too. It’s even easy to store after use. It will suit a family of about 4-6 people. It has a 14 smart pre-set program to guide you into whichever food you intend to cook and 7 temperature settings. The 14 pre-set program is an indication that most likely all the food you eat, you can cook in the instant pot. I like the fact that the cooker can keep your food warm or slow cook it using 3 temperature settings. The device is further UL and ULC certified with about 10 proven safety mechanism. It’s kitchen-friendly with a dual pressure-cooking setting to reduce the time it takes you to cook. What’s more, it’s made using the stainless-steel material of a healthy food grade 304. Unlike other tools, it has no chemical coating. It has a 3- ply stainless steel bottom. Its exterior has a stainless-steel brushing to retain its clean and fingerprint proof external surfaces. It’s further easy to clean because its internal pot, steam rack and the lid is dishwasher safe. It carries along its recipes for you to try. It has all the interior surfaces in high-quality stainless-steel material. The only parts that are made from plastic are parts of the exterior surface. This is safe for use yet durable. Its time saving and you can have it for multiple uses. It’s a replacement to your slow cooker or the stovetop. It mostly suits those who come home from work so tired to cook. It’s energy efficient which means it reduces the utility bills ultimately. It’s programmable and easy to use. You can program it for a 24 hrs use. It gives you a longer warranty because it’s built to last long anyway. It’s highly priced but worth the price. I think it cuts on various costs that regard frequent repairs and need to buy different kitchen appliances. Always be careful because if you don’t use it properly you may get burnt. Getting used to it may take a while because it has so many functions. Sometime, you may get an error message. WHAT IS A POWER COOKER? This features an airtight cooking device that cooks your food quickly using the steam pressure to deliver a delicious meal. This steam helps to retain the moisture. It’s quite like the instant pot, in fact, it cooks way faster than the traditional method of cooking. Since the cooker cooks by trapping the moisture, it’s obvious that the food you are cooking in here will burst with flavor while maintaining a high nutrients level. This is another speed cooking item that by the press of a button you can cook so many meals. You will cook healthy delicious meals 70% faster than the traditional method. It has a flavor enhanced technology to lock in the steam thus giving your food the flavors and nutrients. Even for your meats, you don’t need a lot of oil to enhance the flavors. With a single press of the button, you can cook your meat, fish, chicken, beans, veggies, rice and stews. It will keep your veggies crispy while retaining its natural fiber nature. It further stands out because it cans your fruits and veggies. It has a slow cooker function that cooks your slow cooking meals 10× faster. It has a safe lock lid with a manual steam release system. Its inner pot is non-stick and dishwasher safe and the exterior surface is polished with stainless steel for easy cleaning. It like the instant pot has the built-in safety features which include: the safety release valve, cold touch exterior, safe lock lid and auto-lock handles. Lastly, it will fit in whichever interior design decoration. Buying it gives you bonuses in terms of recipe book, canning guide, ladle and measuring cup. The main feature is that it has a holding capacity of 6 quart and a 1000 wattage. It has a volume of 8 quartz and 1300 wattage. This is an extra-large cooker. It carries a capacity of 10 quart and has a wattage of 1600. It has a volume of 8 quartz and 1300 watts. However, it also has a powerful flavor infusion technology. It has a one-touch design button set that is easy to use. It’s manufactured in varying sizes. It has a unique canning and preserving function. It prides itself on having the largest option for a bigger family. It’s versatile when it comes to cooking. The inner coated surface that is in contact with your food is not the best. It can’t make the yogurt and other recipes that the instant pot can. It only has a 10-touch pre-set program. To understand the two cookers clearly, we must check their similarities as well as the differences. They are both multi cookers. They have dual pressure settings. They both have customization settings. The exterior material is normally stainless steel. To check the differences, let’s understand the different features they have. This is a vital feature for any kitchen tool. You want an item that will enhance the aesthetic value of your kitchen. The designers of the pressure cookers are equally clever because they come up with a design that calls you to use them. It’s the nature of every human being to like things based on their appearance. If your tool is perfectly designed, cleaning it becomes easy and ultimately rendering you the hygienic food. This emulates the design of a round slow cooker. It has a button pad that’s large and easy to read from a distance. It also has a red indicator menu. It features 3 sizes: 3-quart, 6-quart and 8-quart. Its interior is made of dishwasher-safe stainless-steel material. You can lift the interior pot off the base and it has a lid that is vital for the perfect cooking. The lid has a pressure valve and a food blockage seal on the inner side. It also has a ringed seal all this to ensure you tightly fit the lid before you begin cooking. Also, ensure your gasket is sealed before you begin cooking. When you are done cooking, always open the lid away from you or else the steam may burn you. This looks like a basic slow cooker without extra decorations. It’s a large and round solid cooker that will occupy more space on your counter than the instant pot. You only need to twist it when locking it. The lid is said to be heavy and thick. It has a heavy handle for easy carrying with a valve that releases steam. Its exterior surface is mostly made using stainless steel but I’m concerned about the interior that is made using Teflon. It sure helps with non-sticking issues but Teflon is a harmful chemical compound. Like the instant pot, it has a clear control panel with all labels and it’s easy to use. It features 4 sizes: 6-quart, 8-quart, 10-quart, 8-quart deluxe. Most of its parts are dishwasher safe. I don’t like a gadget that gets me soaked into the manual trying to understand how to operate it. There are many such machines and for me, it’s better to have an easier to use the gadget. This part is for you to find out which machine is easier to operate. The moment you unpack your new cooker and place it on the kitchen counter with the lid on you will notice the nozzle has two distinct settings. One side says venting while the other side says sealing. Whenever you want to cook, make sure the lid is properly sealed and for the pressure cooking always make sure the nozzle points towards the sealing side. It also has a control panel with various distinct function including buttons meant to cook various foods. When you want to switch from one to the next button, press the cancel button first then press the other function you want. It’s easy to use with the timer available. Whenever you press the button it beeps and when its preheated it also beeps while when you need to vent the steam it will also beep. This is the easiest to use because the moment you plug it on to the socket it’s on and begins to cook. it also has buttons for you to choose the food you are cooking and the buttons also indicate the time it will take. It takes time to preheat and during this time you can add your ingredients then cover it with the lid safely. It begins cooking when it goes to the pressure mode. It has a quick release method which releases the steam within a minute then it unlocks. This was the major reason that these pressure cookers were founded. The aim was to reduce the cooking time. This means that the one that can cook faster is best preferred. The cooking time indicated here includes the time you take to prepare the food before placing on the cooker. The name may mislead you but notice that nothing is cooked on an instant. In fact, the cooking times vary depending on the food. The pot has a delay time before it starts. This is to heat up the pot. Remember to include the preheating time which is usually around 5-10 mins. After it gets hot, the cooking time is very fast you won’t even believe it. Imagine cooking a frozen chicken for 10 minutes. Isn’t that faster than even your stir-frying process. The same delay time to preheat is experienced here. However, the moment it begins cooking the process is as fast as the instant pot. In fact, none cooks faster than the other because the difference is always just anything less than 10 minutes. Here we find out the types of meals that each can cook. As much as the cooking time and design are important the versatility is equally essential. 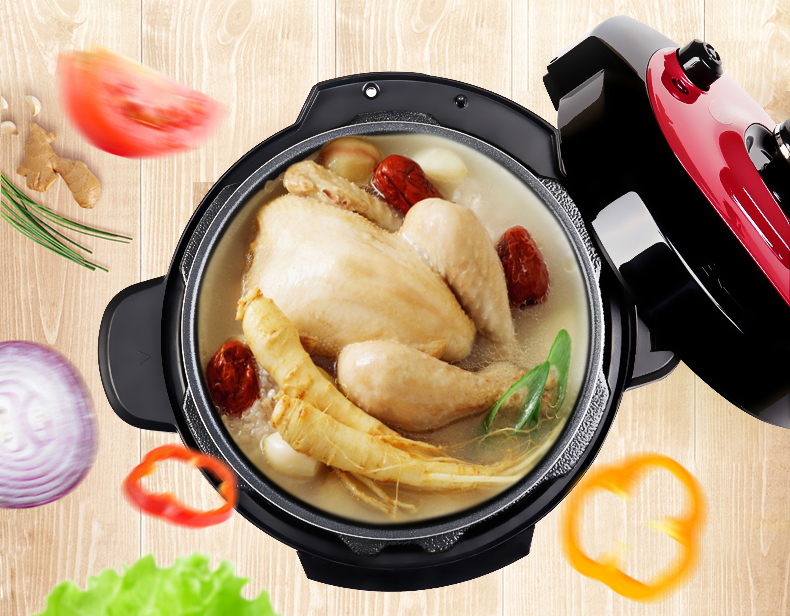 This is because it is the only way you make the most out of the pressure cooker and hot pot. It will also allow you to make a batch of meals within a short duration. The multicooker function allows you to make a dozen of meals depending on the model you buy. Use the instant pot to make your soups, stews, broth, porridge and other slow cooking dishes. Consider sautéing or browning different kinds of meats, make yoghurt, bakes cakes, steams your veggies and it cooks eggs. The list of meals you can make using this gadget is endless but when it comes to deep frying for the crispy texture you will have to use other items. It is also not your oven because aside from making the cakes, it won’t bake other items. Its control panel indicates to you that it can cook thousand of dishes which include soups, beans, lentils, rice, chicken and even the canning process. However, it doesn’t have the baking function so it won’t make your cakes. It also can’t make the yogurts and in fact, it doesn’t cook as many dishes as does the instant pot. Here all of us would want the cheaper model but be sure to confirm that you don’t have to buy extra accessories and repair it often thus being costly in the long run. This is costly but worth it because it’s durable. The materials used to make it is durable and it features a strong design which makes it worth the cost. Besides, it has other cooking functions that a pressure cooker doesn’t have. This is way cheaper than its counterpart the instant pot. It also allows you to buy accessories on the side. But when it comes to durability, the instant pot is unparalleled. 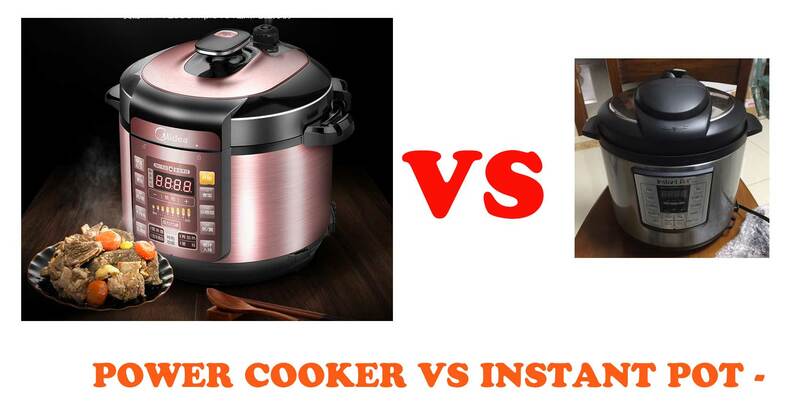 The main difference is therefore that the power pressure cooker has a canning function while the instant pot doesn’t. On the other hand, the instant pot has a yogurt maker while the pressure cooker doesn’t. The instant pot gives you a longer warranty period than the power pressure cooker. The power pressure cooker has a larger model than the instant model. Its 10 quarts sized cooker. Visit any departmental store or supermarket for the various choices available. The other best place to source these appliances is online. This is because you will find countless models to choose from. They are also from different manufacturers. If you know of any kitchen speciality store visit it to find the appliances. When looking for either kind of pressure cooker you want to go for a durable material. The stainless steel is the best and even better when it’s the 18/10 stainless steel. It keeps your machine corrosion free and durable. The cooker is supposed to work as pressure cooker so go for one that can reach up to 15psi. Also, make sure the cooker alerts you when this level is reached. Does it have a quick release? A good pressure cooker will have a quick release which lowers the pressure in the pot without releasing the heat. This should take place in a minute or 2 minutes. As much as you want something that helps you to cook faster, your safety is paramount. If you aren’t keen, these gadgets will burn or scald you. Always choose a model that has an enhanced safety function. Unlike the past, today there are modern features that help with safety. Find one with a vent and stem valve. Whether you are buying the item to use it occasionally or daily, you need an appliance that will last for years. 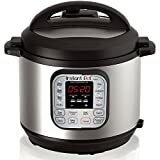 Depending on the intended use and the number of people you will cook for, the instant pot and pressure cooker have almost every size available. However, if you want a very large size then the pressure cooker will work for you. Setting the correct time is vital if you will have a proper meal. Remember veggies and fruits cook within a short duration and you want to be observant to avoid overcooking. You are cooking different foods in the pressure cooker some may require that you add other ingredients amidst the cooking process. Mark your timer to know when to add the ingredient. When cooking using the pressure cookers, you must follow the recipe to the latter. Don’t mess with the liquid ingredients because they are the source of moisture. The cookers aren’t meant for frying. Don’t deep fry with it unless the cooker is designed for that function too. Remember to remove the lid when you want to store the cookers. This is to avoid the development of molds and the food odor retention after cooking. If you can sprinkle the baking soda in the cooker the better. Whenever you are cooking, don’t leave it unattended for long to avoid accidents. Before you begin using the appliances, read the instructions for more guidance. Since the pressure cookers are an easy way to cook when you want to buy one you may have to consider your budget line, the size, safety feature and ease of use. Remember, you must conduct a market research to find a pressure cooker that works for you. Depending on what you are after though, both these items offer value. The features are unique for each appliance. So, maybe you should know which functions you are after before buying one.